For 50 Years, Little Milton's Blues Were 'Alright' The son of Delta bluesman Big Milton Campbell made his first record at 18 and was still performing three weeks before his death this week. Rock and blues expert Peter Guralnick reflects on Little Milton's career. Little Milton died this week at the age of 70, ten days after suffering a stroke. He learned to play guitar and sing the blues from his father, "Big Milton Campbell," a musician in the Mississippi delta. At 18, Little Milton made his first recording with Sun Records, and launched a career that would thrive for half a century. 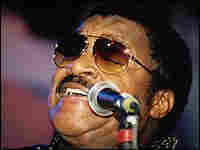 He went on to record hits such as "The Blues is Alright," "We're Gonna Make It," and "Little Bluebird." He was still touring this year, and last performed just three weeks ago at the North Atlantic Blues Festival. Peter Guralnick, a leading expert on American blues and rock 'n' roll, reflects on Little Milton's career. Hear an NPR Interview with Little Milton from January 2000.